Welcome to Volume 7 of a series that I’m calling: Wedding Photography for Beginners! In the next few weeks, I’ll be taking you through a number of important topics and giving you insider’s tips and tricks. My goal is to make your transition into professional wedding photography as easy as possible. There will be 8 articles in total that will discuss everything from attracting new clients…to revealing the best kept secrets for capturing breathtaking bridal shots. Did you miss Vol. 1, Vol. 2, Vol. 3, Vol. 4, Vol. 5 or Vol. 6? Let’s get you caught up! Interested in reading all the articles but don’t have time to check the blog? Subscribe to The Presetpro Weekly Newsletter and get all 8 articles PLUS Free Lightroom Presets sent to your inbox every Tuesday! Wedding reception venues are usually poorly lit and notoriously difficult to photograph. This is where a tripod can be helpful! When shooting the venue and the decor before the guests arrive, use your tripod to steady your camera and dial in a shutter speed with a long exposure. Your goal is to absorb as much light as possible! Extra Tip- Never use a long exposure on people or anything that moves. Your photos will come out blurry and you won’t be able to use them. Lighting the venue with off camera flash (mono lights, etc) and having a speed light paired with a diffuser always present on your camera body will be key to capturing beautiful photos in low light. See Vol. 1 for a complete explanation of the lighting equipment commonly used at weddings. I suggest angling the off camera lighting towards the dance floor as this is where most of the action happens. Using a step stool will greatly improve your wedding reception photos. Never underestimate how useful this little contraption can be! You can use it to gain a higher vantage point of: the dance floor, the head table, the venue shots, etc. Having the option of shooting from different heights is guaranteed to make your photos more unique and interesting! Many new wedding photographers are in the dark about the proper etiquette for accepting food and drink at the reception. The truth is, there are no hard and fast rules when it comes to this subject. What I can say is that it’s common for a wedding photographer to ask the couple for a meal at the reception. If the couple is uncomfortable with this request, you can explain that it’s important that you don’t leave the venue. You would hate to miss an impromptu speech or a toast from a family member while you’re off grabbing something to eat. Alcoholic drinks always play a big part in a wedding, so it’s only natural that you may be offered a drink at some point during the night. Again, there are no concrete rules here, but the professional thing to do is to decline the drink while you’re still working and assure the couple/guest that you’ll join them for a drink after you’ve packed up for the night. You’ll quickly learn that photographing a wedding can feel an awful lot like running a marathon! You’ll be working from early in the morning to late at night and it’s important that you schedule a few breaks so that you can sit down and drink some water. I also find that stretching can be helpful as your arms will get a major work out from holding the camera all day. Have a discussion with the couple about taking breaks before the big day. I also recommend that you quickly inform them (if it’s appropriate) that you’re going to take your break prior to leaving the room. Remember, every professional wedding photographer started out exactly where you are right now. You can do this! 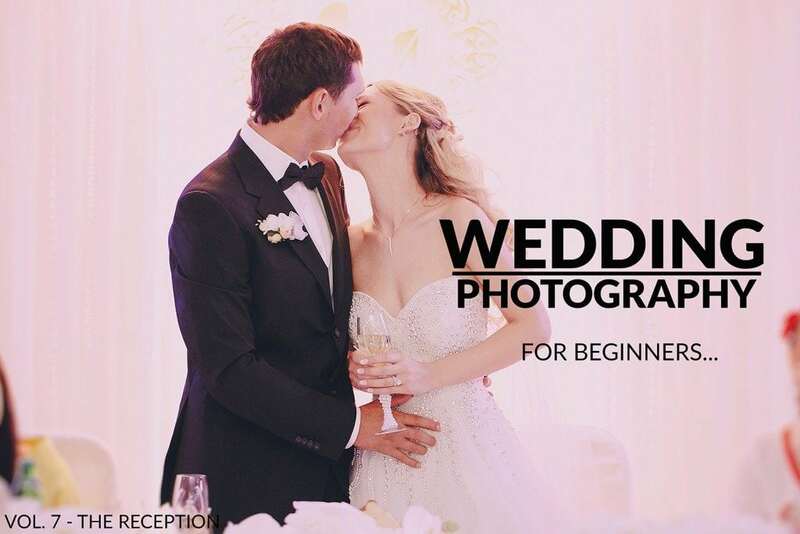 With a few tips and tricks, you’ll be on your way to producing beautiful reception photos in no time! Don’t miss Vol. 8 next week on the blog where we will discuss Post Processing. Thanks for reading and I’ll see you next week! Looking for Wedding Lightroom Presets? Checkout the Creative Flow and enjoy over 1000 Lightroom Presets & Creative Brushes: The Creative Flow is the ultimate workflow and premium preset collection by Presetpro. The Creative Flow is your own personal preset “tool box” where you can swap out tone curves, change base settings or easily color tone your image with a few simple clicks. When you purchase the Creative Flow you get all of our premium collections (at a discounted price) plus the Creative Flow workflow and Creative Brushes. Enjoy the power of 1000 + Lightroom presets integrated into one simple and easy to use workflow! This entry was posted in Wedding Photography and tagged Adobe Lightroom, Adobe Lightroom Presets, Aperture Priority, Best Wedding Photography Tips, Blending Light, Bridal Photography, Business Cards, Check List, Create a staged wedding shoot, DSLR, Fine Art/Fashion, Free Lightroom Presets, How do I book my first client, Lighting, Lightroom Editing, Lightroom Presets, Logo, Pastel Colours, Photojournalism, Photomatix, Professional Wedding Photography, Social Media, Traditional, Volume 6, Website, Wedding Photography, Wedding Photography Check List, Wedding Photography for Beginners, Wedding Photography Lenses, Wedding Photography Tips & Tricks, Wedding Photography Tips for Beginers, Wedding Photography Tutorials.